Dog owners who work long hours know how sad it feels to imagine their pups sitting alone at home. But imagine no longer, people, because this treat-popping dog camera will keep you and your pup connected, no matter where you roam. A command on the Furbo app remotely unleashes a treat, which will spit out of the machine at home and entertain your dog for endless hours. 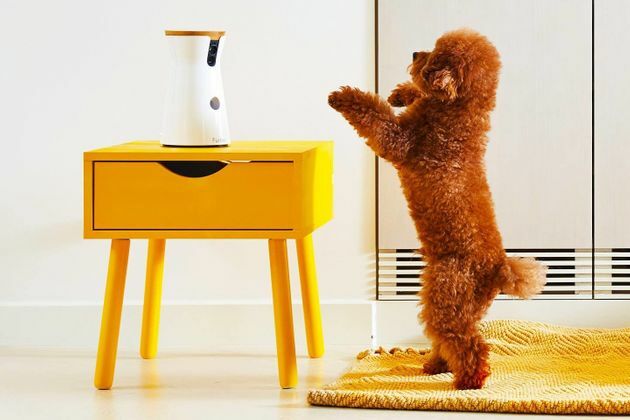 The Furbo also comes with 2-way voice technology: You get a push notification when your pup starts barking, and you can loop in your voice and chat to him until he calms down. There’s also night vision, in case you want to witness the raging parties your dog throws during your late nights at work. If you don't work in a pet-friendly office environment, there's still a way to interact with your dog during the workday. Furbo has made a stylish, and very user-friendly pet camera. If you are want to have a plug-and-play Pet camera that can shoot treats, and has night vision, Furbo is our recommendation! ¡Suscríbete a nuestras actualizaciones y ofertas especiales!